In November of last year, Evie Lasher of Ireland approached her father, Faron, with the idea of singing songs to people in nursing homes. 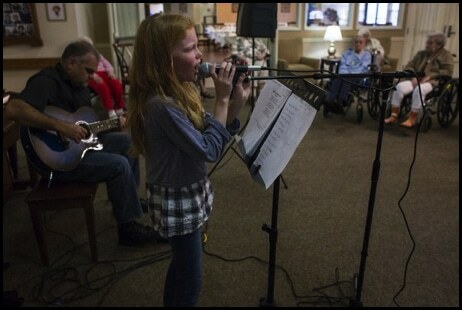 Evie, who will turn 11 on Friday, performed a selection of music with her father for residents of Brookside Village Senior Living Community in Jasper. The young singer said she likes performing because of how much the residents enjoy the music. In addition to singing at Brookside, Evie and her father have performed at nursing homes in Ferdinand and Tell City.